You can login into the Customer Care Self Service Portal from the Colonial Parking® homepage & will need to do so every time you would like to make a change to your account. 1. Visit our homepage, www.ecolonial.com. 2. On the homepage, you will see a Customer Login box. You can make a payment on your monthly account at any time via the Customer Care Self Service Portal. From the Customer Care Self Service Portal homepage, you will automatically be shown your billing history. 1. To make a payment, select Pay Now. 2. You will reach the Payment screen. 4. Check that you have read & agree to the Terms of Service. 5. Select Process Payment & you’re done. AutoPay® deducts your monthly bill from your bank account or credit card automatically each month. Once you sign up, you don’t need to worry about paying your bill on time! Many locations are mandatory Autopay® enrollment facilities, so signing up may not be necessary. 3. 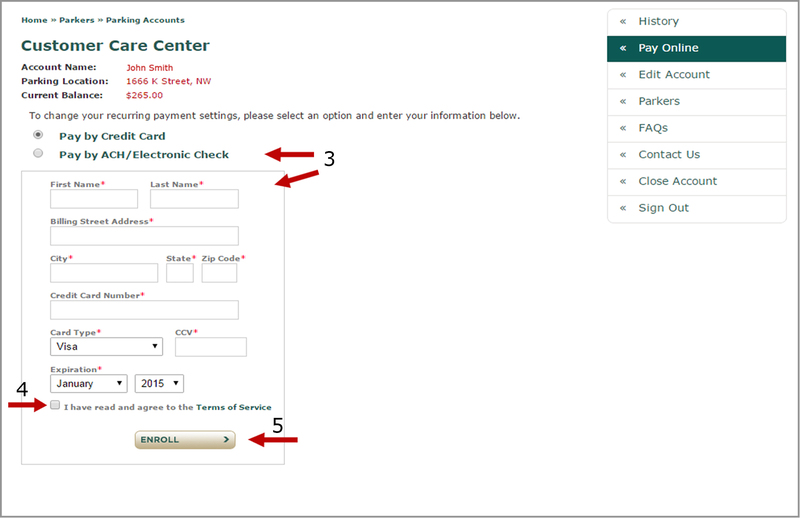 Enter your method of payment & billing information. 5. Select Enroll & you’re done. You can edit any billing information, such as billing address, credit card number, expiration date, etc. 1. From the Customer Care Self Service Portal homepage, select Pay Online. From the Customer Care Self Service Portal homepage, you can view your complete billing history. However, if you would like a more detailed look at a specific invoice you can access each single invoice. 1. From the Customer Care Self Service Portal homepage, select the invoice you would like to review. 2. A window will pop-up with your complete invoice. 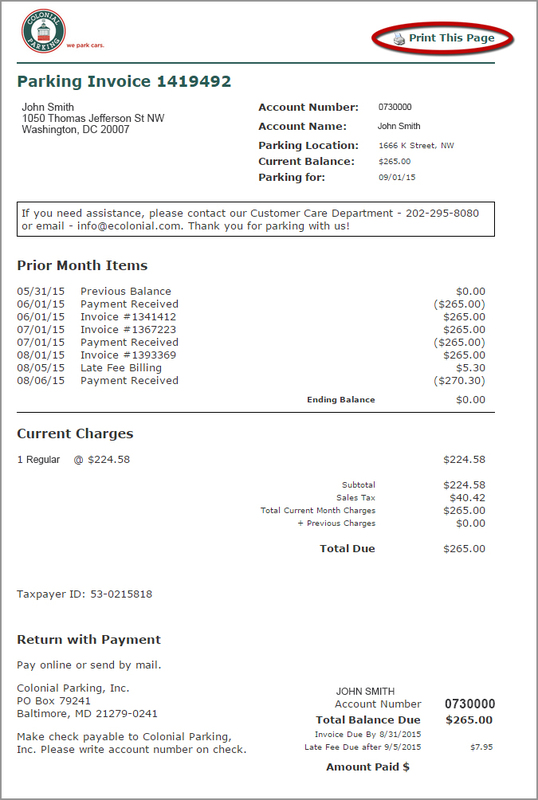 You can select “Print” in the top right corner of the invoice to print. From the Customer Care Self Service Portal you can view all parkers currently on your account. 1. From the Customer Care Self Service Portal homepage, select “Parkers” on the right side of the screen. 2. This will take you to a full list of all your parkers. 3. From this list, you can select “Request a Parker” to add a new parker to your account. 3. On the following screen enter your parker & vehicle information. 4. Click “Request Parker” & you’re done. Requests can take up to 72 hours to process. 1. From the Customer Care Self Service Portal homepage, select Edit Account from the menu on the right hand side of the screen. 6. Select Save & you’re all set to go. While we hate to see you go, we understand that sometimes you need to close your parking account. You can do this from the Customer Care Self Service Portal. 1. 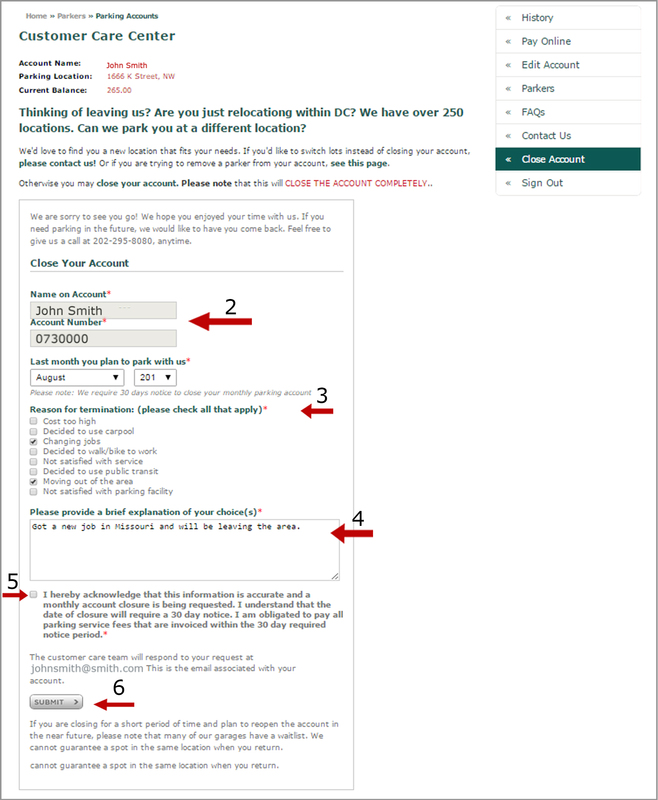 From the Customer Care Self Service Portal homepage, select Close Account from the menu on the right hand side of the screen. 2. 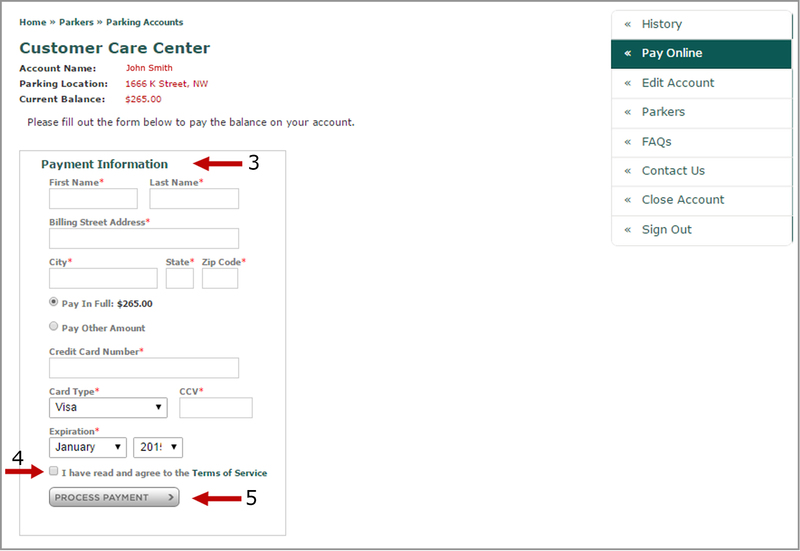 On the following screen, enter your account information & the last month you plan to park with us. 3. Select your reason(s) for closing your account. 4. Provide a brief explanation on the reason for closing your account. 5. Select that you acknowledge that the information is accurate and you understand the closing policies. 6. Select submit. Our Customer Care team will receive a notification and will terminate your account. Please note: 30 days notice is required in order to close your monthly parking account.